This article contains an overview of the history of the rise of the Republican Party, its leaders, presidents and their beliefs. Summary and Definition of the Republican Party: The Republican Party is one of the two major political parties in the United States of America, the second group being the Democratic Party. There have been 18 Republican presidents. The Republican Party, originally called the National Union Party, was formed in 1854 to oppose the extension of slavery. The Republican Party is known by the acronym GOP meaning "Grand Old Party". Republican Party History: Jeffersonian Republicans? Democratic-Republicans? National Republicans? The term 'Republican' was used in American politics prior to the formation of the modern Republican Party in 1854. There is reference to the Jeffersonian Republicans, the Democratic-Republican party and the National Republicans which, not surprisingly causes considerable confusion. Our articles on the History of Political Parties of the United States or the Timeline U.S. Political Parties provides a short summary of these political groups and will help to clarify when these early parties were formed, their beliefs and their leaders. The Democratic Party was formed in 1832 by Andrew Jackson. The Free Soil Party and the National Union Party was the forerunner to the Republican Party and was formed to further the beliefs of national interest above sectional interests and states' rights. The National Union Party was organized in 1854 in opposition to the extension of slavery. In 1860 Abraham Lincoln was elected as its first leader and following his death in 1865, Andrew Johnson became the only other National Union President. The 'National Union Party' then changed its name to the Republican Party. The bitter question of slavery that was dividing North and South and dividing the political parties. The Compromise of 1850 had been an unsuccessful attempt by Henry Clay to settle the the status of territories acquired during the Mexican-American War (1846–1848). The Compromise of 1850 led to the destruction the Whig Party. The Whigs from the southern states moved to the Democrat Party and the Whigs from the northern states moved to the newly formed Republican Party. The supporters of the newly formed Republican Party consisted of Northern Whigs, Northern Democrats and members of other political groups, such as the Free Soil Party, who opposed the expansion of Slavery into new U.S. territories and states. What caused the formation of the Republican Party and when was the Republican Party formed? The bitter question of slavery was dividing North and South and splitting the political parties. The Republican Party was formed in 1854 by opponents to the 1854 Kansas-Nebraska Act, who organized the new Republican party. The Kansas-Nebraska Act, based on the doctrine of Popular Sovereignty and Slavery, provided that the settlers of the new territories of Nebraska and Kansas had the right to say whether that territory should be free soil or slave soil, effectively ignoring the purpose of the Missouri Compromise of 1820 which was to retain the balance between slave and free states. The Republican Party grew with amazing speed attracting all the other parties who agreed in opposing Douglas's Kansas-Nebraska policy. Members of the Republican party extended to include the Abolitionist Movement, the Free-Soil party and the Know-Nothing movement. Within six years Republican nominee Abraham Lincoln won the U.S. presidential election in 1860. This was the point when American party politics changed to the familiar contest of Democrats versus Republicans. Why was it called the Republican Party? The Republican Party adopted its name to reflect the past glories of the old party of Thomas Jefferson, James Madison and James Monroe at first referred to by the acronym GOP meaning the "Gallant Old Party" which changed over time to mean the "Grand Old Party". 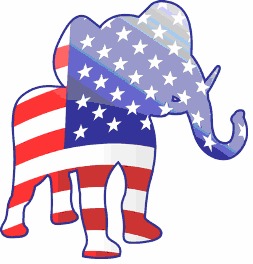 The Republican Party adopted the elephant as their symbol. The symbol of the Elephant is credited to Thomas Nast, the famous political cartoonist, who had also been responsible for the Democratic donkey symbol. Thomas Nast published a cartoon that appeared in Harper's Weekly on 7 November 1874, drawing a donkey clothed in lion's skin, scaring away all the animals at the zoo. One of the animals, the elephant, was labeled "The Republican Vote." The elephant symbol caught the imagination of the public and it became the unofficial symbol of the Republican party representing the Republicans as docile but unmovable when calm, unstoppable and destructive when angered. Shortly after Abraham Lincoln's victory, several southern states seceded from the Union. The establishment of the Confederacy unleashed the American Civil war (1861-1865). The Confederate States of America was formed in February, 1861 and composed of the 11 Southern states that seceded from the United States in order to preserve states' rights and slavery. Support for the Republican Party and Abraham Lincoln was concentrated primarily in the North. In the years following the Civil War the Republicans attempted, with some success, to brand the Democratic Party as the party of rebellion. The Republican Party had control of Congress and oversaw Reconstruction, the name given to the period of rebuilding for the defeated South. President Lincoln favored a conciliatory attitude toward the vanquished Confederacy but the party was divided into three factions, the Conservatives, the Moderates and the Radicals. The differing views of the Republicans weakened the party and then the moderate President Lincoln was assassinated in 1865. Andrew Johnson assumed the presidency from 1865 - 1869. During the moderate Johnson administration the Reconstruction policies of the Republicans, such as conferring citizenship and voting rights to former slaves, resulted in long-lasting resentment among the eleven Southern states of the old Confederacy. The South voted for the Democrats, with few exceptions until the 1960s, giving rise to the term the "Solid South", used to describe the electoral support of the Southern states for Democratic candidates from 1877, which was the end of Reconstruction, right up to 1964 with the passing of the Civil Rights Act. In 1869 the war hero, Ulysses S. Grant, was elected President and the first leader of the re-named Republican Party and served in office from 1869-1877. The Republican Party was in the ascendancy and began a period of national dominance that lasted for more than seventy years, with only an occasional break-through by the Democrats. President Grant was a radical Republican and the Grant administration was marked by scandals and the excesses of the Spoils System. This led to a split in the Republican party and the formation of the Liberal Republican party led by Horace Greeley. Horace Greeley was supported by the Democrats, was unable to defeat Ulysses Grant in the 1872 presidential election and the bribes, kickbacks and corruption became even more widespread. The radicals in the Republican Party lost support during the scandal ridden administration of Grant. The Republicans still succeeded in the next presidential campaign to the moderate platform of Rutherford Hayes. Hayes was elected and his presidency was from 1877 - 1881 during which he introduced Civil Service Reforms in an effort to end the 'Spoils System'. The Republican Party succeeded in the next campaign and James Garfield was elected the 20th president of the US in 1881. His presidency was short-lived due to an assassination attempt which led to his untimely death. The Chester Arthur served in office from September 19, 1881 to March 4, 1885 and following the assassination of James Garfield and the Star-Route Scandal which involved the bribery of Postal Officials the Pendleton Civil Service Reform Act was passed. The Pendleton Civil Service Reform Act moved away from the 'Spoils System' and stipulated that government appointments would be made according to merit. Grover Cleveland revived the Democratic Party with his election in covering 1885 - 1889 and again in the 1893 election although Republican Benjamin Harrison split his presidencies. Benjamin Harrison was a Republican Party president from 1889 - 1893. The "Billion Dollar Congress" cost the government over a billion dollars and the panic of 1893 that would lead to a major depression resulted in the re-election of the Democrat Grover Cleveland. William McKinley was a Republican Party president from 1897-1901. William McKinley established conservative economic doctrines and championed the gold standard. His presidency and term in office ended with his assassination by Leon Czolgosz. Theodore Roosevelt was a Republican Party president from 1901-1909. Theodore Roosevelt adopted the "Square Deal" domestic policy in which he pledged not to favor any group of Americans but to be fair to all. He supported aggressive political reforms, including the heavy regulation of business and a vigorous foreign policy. William Taft was a Republican Party president from 1909-1913. William Taft "Taft's dollar diplomacy" that called for the use of diplomatic and military action to further foreign business interests. A new rift appeared in the Republican party due between those who favored conservatism and those who favored Progression. The split led to the election of the Democratic candidate, Woodrow Wilson. Calvin Coolidge was a Republican Party president from 1923-1929. The administration of Calvin Coolidge passed the Revenue Acts of 1924 and 1926 reducing inheritance and personal income taxes after years of high wartime tax rates. The Immigration Act of 1924 ended further immigration from Japan and restricted the number of immigrants from southern and eastern Europe. Calvin Coolidge surprised the nation by announcing that he did not want to run for President in 1928 and was succeeded by Herbert Hoover. Herbert Hoover was a Republican Party president from 1929-1933. The presidency of Herbert Hoover was wrecked by the the 1929 Wall Street Crash in which billions of dollars were lost in a single day and led to the Great Depression. The stock market was unable to pre-depression levels until 1954. The public blamed their problems on the President who was not re-elected. The Democrats, under Franklin Delano Roosevelt gained and overwhelming victory in the next election and the Republican Party and suffered continuous defeats for the next 20 years. Dwight Eisenhower was a Republican Party president from 1953-1961. The popular, conservative General Dwight Eisenhower took the presidency at the end of the Korean War and the start of the Cold War and the fight against communism. The National Aeronautics and Space Administration (NASA) was established to keep U.S. space endeavors in front of the Soviet space efforts. Gerald Ford was a Republican Party president from 1974-1977. Gerald Ford granted the disgraced Nixon an unconditional pardon explaining that he felt it was in the best interests of the country. It was received as an unpopular action by many Americans and the Republicans lost the next presidential election to Jimmy Carter. Ronald Reagan was a Republican Party president from 1981-1989. Ronald Reagan was one of the most popular of all American presidents. His presidency saw major events such as Glasnost with the Soviet Union and the Fall of the Berlin Wall. The 1986 Iran-contra scandal marred the last years of his presidency but his vice-president, George H. W. Bush was successful in the next presidential election. George H Bush was a Republican Party president from 1989-1993. The administration of George H Bush saw events such as the Dissolution of the Soviet Union and the End of the Cold War. His strong action during the Gulf War met with approval but his lack luster domestic policies were blamed for a stagnant economy and high unemployment. The charismatic won the next election for the Democrats and it was 8 years before the Republicans gained power under George W. Bush. George W Bush was a Republican Party president from 2001-2009. George W Bush and the stunned nation witnessed the horror of the 9/11 Terrorist Attack on the World Trade Center and the Pentagon. The Second Gulf War dominated his early presidency and Credit Crunch started in 2007 with the sub-prime mortgage crisis which led to the recession and the decline in the popularity of the Republican Party who were defeated in the next presidential election by Barack Obama. The article on the History of the Republican Party provides a fast overview of the history of the US Government. The following Presidents of the USA video enables you to sit back and listen to the history of all the Presidents of the USA - a useful educational resource for kids, children and schools that complements the information found in the History of the Republican Party.